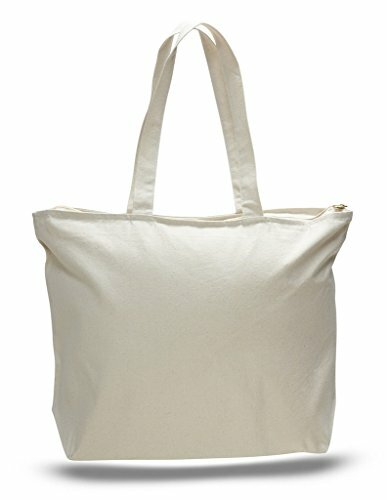 This large size reusable, eco-friendly, multipurpose, 100% cotton canvas shopping tote bags with 5"D square bottom gusset comes in multiple colors and will be an essential part of your life. The squared off bottom lets your bag stand up straight and the full length main zippered compartment lets you store anything secluded and safe while having easy access at all times. The interior zippered pocket (approx size of the pocket is 6.5"W x 6.5"W) will keep your valuable items safe and provide a rapid access for your belongings. Soft 26" web handles provide a very easy use. For your supermarket shopping, handles are reinforced at stress points so your stuff can be safely carried and your groceries will not fall on the floor. Perfect for using as a grocery bag, pool bag, beach bag, travel bag, shoe bag, scout bag, goodie bag, for school or work, or as a book bag. These are excellent for getting a little creative with your DIY, art and craft works. It will be the marketing of your brand as a promotional product for all kinds of conference and conventions, trade show giveaways, school fundraisers, corporate gifts. For handing out at your next big event. Customize with your choice of imprint method silk screening , embroidery, iron on transfers, heat press, transfer printing, full color transfer, pad print, overprinting. The reusable, 100% cotton canvas fabric, economical, grocery shopping tote bag has a full length main zippered compartment and also an inside zippered pocket. The measurements of this bag are 20"W x 15"H x 5"D. This large size tote bag has a 5"D square bottom gusset ensuring support and stability. The self-fabric handles with the height of 26" are comfortable and easy to carry and the bags are sturdy. Many groceries can fit into this reusable sturdy 12 oz heavy canvas tote bag. Imprint size (14"W x 10"H) for your promotions, fundraisers, giveaways. You can apply iron on transfers, heat press, screen print, embroidery, transfer printing, full color transfer, pad print, overprinting, and you can even create adorable tie dyed bags Hand wash only with damp cloth. Do not machine wash.